A new iPhone design with a polycarbonate body similar to Apple's legacy entry-level MacBook may be released at a targeted price of $330, while plans for a next-gen handset with 4.5-inch display have been pushed back to 2014, according to a new report. Update: In an update to its original report, Macotakara now claims there are two distinct forthcoming iPhone models, an iPhone 5 follow-up with a 4.5-inch LCD and a less-expensive version made from polycarbonate. The publication originally listed the two separate phones as one device. This article has been updated to reflect the changes. The details were published on Thursday by Japanese blog Macotakara, which claims that Apple has "deferred" its planned release for a larger-screened iPhone 5 successor, but may debut a less expensive handset sometime soon. As for the cheaper iPhone model, it is suggested Apple will be using a material similar to the glossy polycarbonate body seen on the company's entry-level MacBook, which was discontinued after it was replaced at the $999 price point by the 11-inch MacBook Air. 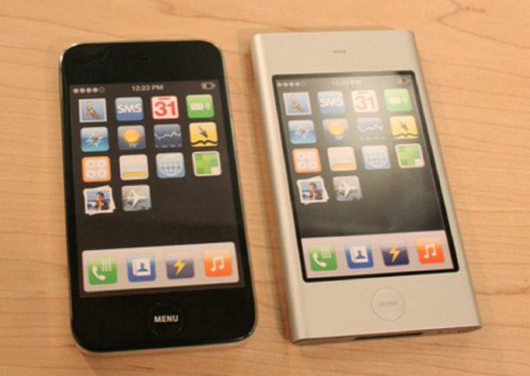 A pair of iPhone mini prototypes were revealed by Apple in its court battles with Samsung. Apple apparently hopes to price its new entry-level iPhone at $330, matching what the company charges for the iPad mini. The entry-level iPhone is also expected to be thicker than the iPhone 5, thanks to the use of a polycarbonate body rather than aluminum and glass. The thicker material will reportedly increase the durability of the device. But in spite of those changes and cost cutting measures, the cheaper iPhone is said to have a design largely similar to all previous iPhones, including a home button below the LCD display. Finally, Thursday's report also made mention of Apple's follow-up to the iPhone 5, sometimes referred to as a so-called "iPhone 5S." It claimed that Apple apparently plans to add a dual-flash LED module on the back of the device to aid in picture taking. The two flash exposures are rumored to be stacked on top of one another to the right of the camera lens. The publication noted, however, that Apple has put the brakes on unveiling the purported next-generation handset that is said to employ a 4.5-inch display, slightly larger than the the 4-inch panel seen on the iPhone 5.